The Hunters are fitted out like only the Americans do. These boats are a class of their own when it comes to layout and comfort. 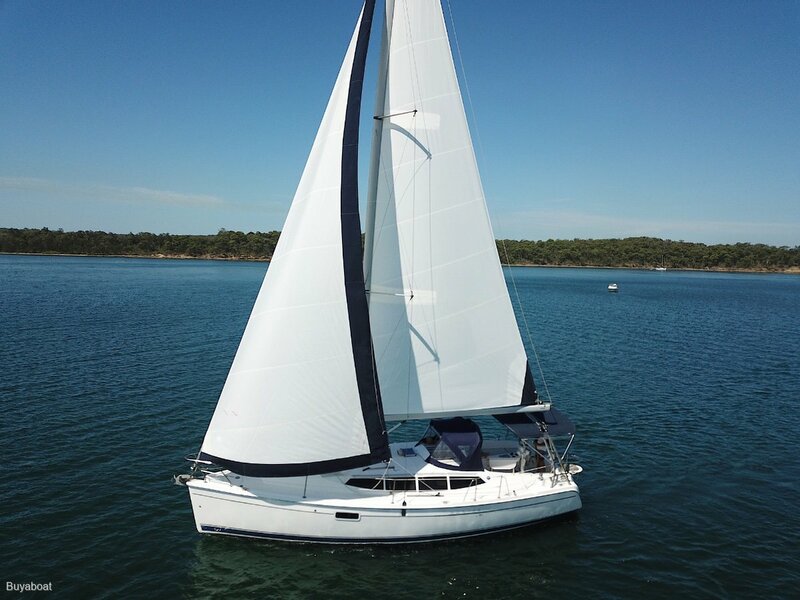 This beautiful yacht is perfect to cruise up the coast or sail on the lake or your favourite waterways, in style. You can easily sail her short handed. The extended model has a fold down aft deck that is used as a swim rack. She has perfect sails, with furling mainsail, and furling headsail. Below she has all the mod cons with the signature drying cupboard for the plates and bowls. This is an attractive vessel, that is well designed and comfortable. Yanmar 39 hp diesel engine. A great engine, economical and reliable with plenty of power. Force 10 gas stove with 2 burners, grill and oven. Microwave, Stone bench tops with lift covers to double sink, with flip tape. Lift up top to garbage bin. Drying cupboard for the wet plates, etc, and heaps more cupboard and storage spaces. 120 L upright Fridge/ freezer. V berth double, Large comfortable starboard aft cabin and dinette folds down double. Two showers, one part of the head, the other in the cockpit, both with hot and cold water. Electric macerator with hand basin and cupboard storage and holding tank. 20 "Sole TV with DVD, JVC Fm radio Stereo. Dodger, Bimini and fill in shade between. Electric anchor winch with Plough anchor, 50m chain, rope, fenders and lines. Yes 2 Auto and 1 manual. 1 start battery and 1 house battery, small solar panel. LED lighting. Heaps of winch's all lines back to the cockpit. This is an awesome Yacht, no need to buy a new one, this is just as good.